Bring the fragrance and flavor of exotic chai spices to your menu with this Steep by Bigelow organic chai black tea! Chai tea is popular in many cultures around the world, and this flavorful chai tea blend combines robust black tea with ginger, cinnamon, cardamom, and cloves. When brewed, it has a spicy, bold aroma and medium brown color. It's also easy to mix this tea with milk and sweetener for a delicious chai tea latte. Steep by Bigelow organic teas, such as this chai black tea, are grown using only natural fertilizers that are free of synthetic pesticides and additives. Chai tea can vary with its quality depending on which brand you buy. Bigelow's Chai makes a special cup of tea with their savory blend of spices. The flavor isn't too spicy like most and offers something unique that tastes great! I strongly recommend this to anyone who appreciates the nuances of black tea. This tea makes for a great base flavor for adding to. Our customers like to add fruit flavoring while still enjoying the chai flavor. Great idea for the box to double as the dispenser. To all the Chai tea lovers out there like me, this is a great product! Add a little sweetener and some milk and tastes amazing! I have tried other chai teas in the past, but Steep's Chai is not like others I have tried. There is a hint of pepper and spiciness in this version that is a great way to wake up on sleepy mornings. I love it with milk and honey, for that perfect blend for both the palate and the warm notes of cinnamon and cloves. Perfect for a winter day! We love these in our café! We sell a lot of tea and it is due to the quality of tea bags we buy. Great flavor! Beautiful packages, and great tea selection at a very affordable price. We keep them in our front counter in the Steep hard case which is very neat and professional, we always get great compliments about the Steep teas our customers have really been liking them. Chai tea or chai spice tea, both are a mandatory for a cafe or tea shop and this product is the best to meet needs. This is a very tasty chai tea.It has a rich, complex flavor and a pleasant scent. it isn't harsh, just delicious, especially with sweetener and milk. I is a mild brewing tea, so steep it a little longer or use a second bag if you use a large mug or like your chai strong. Even so, it is a solid value for a delicious organic tea. The Steep organic chai black tea is bold and delicious. A nice spice with the chai and the black tea is bold and dark. A nice combination of flavors and so tasty. This brews a rich cup of chai - I prefer it brewed in warm milk, but have also had it steeped in water and it still holds up (although not nearly as yummy as it is brewed in milk!). Love that it is organic. This is a nice chai tea. The chai flavor isn't overwhelming like some I've had. It's a perfect little something to warm you up on a cold day. I like mine with a little bit of milk. This chai black tea is great, it's organic, plus the chai is not overpowering. It has a very balanced flavour and is great hot or iced. 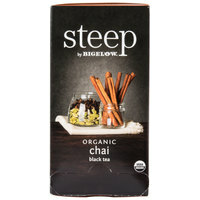 Steep by Bigelow Organic Chai Black Tea tastes amazing! It steeps well and has a tantalizing aroma. It has many medicinal effects. Recommended for any kitchen. These are reasonably priced so the somewhat lack of flavor is ok. The ability to order with a quantity discount is also a plus. Will order again. My favorite Tea! I love chai black tea and this kind was amazing. The perfect amount of flavoring, not too strong not too week. Would definitely recommend! This tea reminds me of fall and everything i love about it! I normally am not to fond of chai tea, but Bigelow brand makes me LOVE it! Very smooth tea taste with Chai dancing on your tastebuds! A wonderful organic chai black tea that is perfect for steeping and making chai lattes. The flavor is rich and the aroma is out of this world good. I love providing an assortment of these organic teas for my customers to enjoy with their baked goods at my farmers' market stands. The box itself is a nice presentation, simplifying service. Not my cup of tea. I don't know if this is meant to be enjoyed straight without being added to something but just as normal steeped tea, it's not great. To each his own. I love chai tea and Bigelow is one of my favorite tea brands. I'm excited to make Iced chai tea lattes with Boba. Great price! Not sure what kind of tea to get? I highly recommend this flavor! it is very popular and i get a lot of compliments from this flavor! It is our number one tea that is ordered so we make sure we keep it in stock. I love this tea! I try to keep several types of tea on hand for clients (and myself) to enjoy during the day and find Bigelow Organic Chai tea is the one everyone requests. This Chai Black Tea has very strong chai smell. It is a little spicy. It steeps out the flavor quickly, thus I would only use one bag for one cup. Great tasting spice in this chai tea. The steep name gives you the assurance that each and every time you are getting the finest quality tea! Great organic chai black tea for anyone who loves this strong and typical chai flavor! Aroma is amazing too! You can also use it for Iced tea! This is good tea.. we are very happy to be able to get this quality of tea for our restaurant . The price is better than other suppliers. If you like Chai tea, you will love Bigelow's Organic Chai Black Tea! It has that perfect blend of flavor that warms you on a cold morning and makes you happy. This was one of five varieties of teas I ordered from Webstaurant for myself and for gifts. I filled attractive mugs with tea bags and gave them as gifts. They were very well received, especially when they saw the unique variety of teas. They were economical, easily ordered and extremely fast delivery. This was my third time ordering from Webstaurant and I love their website. They have so many products! I like that I don't have to place a minimum order and that their customer service is excellent. If you are planning any kind of event; wedding, family, reunion, company party, Webstaurant can help you with the perfect products to make it easy and a success. Check them out online! If you love the Chai Tea Super Concentrate, then you will love this hot Chai tea. It has a full bodied flavor and nice armoa. Is a very good product for the cost. Sir Clean recommend this product Steep By Bigelow Organic Chai Black Tea, the flavor is really good, we like to drink and the price is good. I can't describe how much I love Chai Black tea! This Steep version is no disappointment. I enjoy the organic nature of the tea, and have several other flavors that are also equally delicious! Nice smooth tasting chai black tea. It's organic so you k ow it's not made with any added ingredients that maybe harmful. Nice value for this tea. My family has been drinking Bigelow tea for years. You can never go wrong with this brand. I love that Steep is organic and so flavorful. Bigelow Chai tea is my personal favorite. The box is extremely attractive and seems to catch the customer's eye. In the summer we make sun tea and serve it in small cups to our customers. If we run out of our jug we frequently get questions on where the tea is. The smooth black tea and pungent chai spices make a formidable combination of perfection. This tea is wonderful and we highly recommend it! The packaging is great, too. Chai flavored tea is awesome! Our customers have commented on the fact they enjoy this tea very much. The price point and selection is perfect for us. This chai tea is very weak so I have to use more tea bags to brew 8 oz of tea. I brewed 8 tea bags with 8 cups of water for 20 minutes, it was still weak. So I tried brewing longer but it was not strong enough. Instead, tea had a very bitter taste. I purchased boxes of these, and I regret it. I should have tested it out before I made a bulk purchase. This is a nice tea. The flavor is pretty nice and more complex to some other brands. I appreciate that there are more organic products available on webstaurant. Good product.